What Is a Full Breakfast in the U.K.? Throughout Britain and Ireland, the full breakfast is well known. It is not usually eaten every day but saved for weekends and holidays. The term "full" comes from the fact the breakfast is, well, full of different foods. Full breakfast is served, as you would expect at breakfast time but is also popular throughout the day, often replacing lunch. It is particularly popular in bed and breakfasts, where no stay would be complete without one. Breakfast may begin with orange juice, cereals, and stewed or fresh fruits. 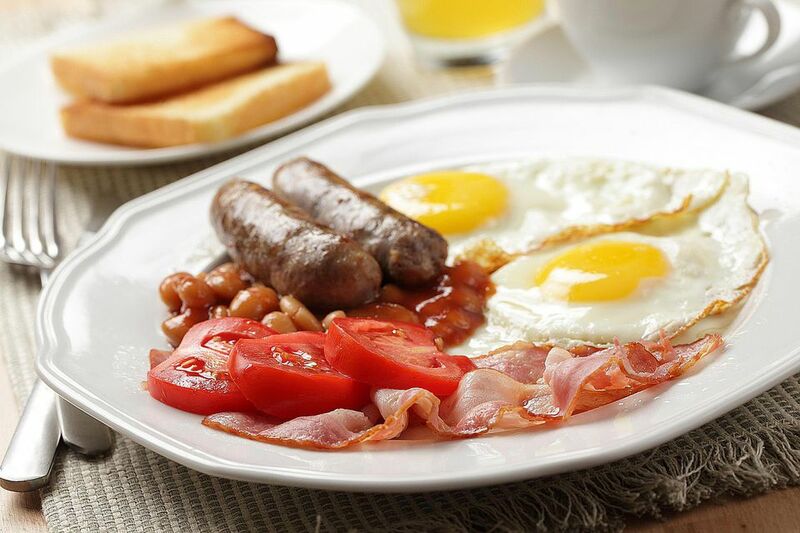 The heart of the full breakfast is bacon, eggs, and sausages (also called bangers in the U.K.). The dish is usually accompanied by grilled tomato, mushrooms, fried onions, toast, and marmalade. A cup of tea is a popular and traditional drink with breakfast, as is coffee. This breakfast is also called a fry-up. Since nearly all ingredients are prepared by frying. Other names it can go by include "a full Monty," supposedly named for British Army general Bernard Montgomery (nicknamed Monty), who was said to have started every day with a full English breakfast during the campaign in North Africa during World War II. In Ireland, a full breakfast is sometimes referred to as a chub. The origins of the breakfast are unclear and believed to have originated in rural England as a sustaining meal to carry workers through a long morning. Full Welsh: Laver bread or laver cakes. These are neither bread or cakes but a side dish made of a seaweed paste, coated with oatmeal, and then fried. Ulster Fry is not dissimilar to a Full Irish. It may include a soda bread farl, which is a soda bread you can fill with the breakfast items and eat like a sandwich. As if all the standard favorites are not enough, there are up to 40 interchangeable items in a full breakfast you can get in the U.K. These dishes include different types of breads, pancakes, meats, fish, and potato items. Popular breads and flour-based, starchy products include eggy bread, crumpets, jolly boys (pancakes), English muffins, butteries/rowies (lard-based bread roll), Crempog (Welsh pancakes), wheaten bread, potato farl (potato bread), and bannocks (flat, quickbread), hash browns, and potato pancakes. Most meat proteins on the plate will come in the form of bacon and sausage, but you can also find a variety of fish dishes and other proteins. These include kippers (herring), corned beef hash, deviled kidneys, kedgeree (curried fish dish), a variety of omelets, Arbroath smokies (smoked haddock), white pudding (sausage), Scottish Lorne sausage (square-shaped), Welsh Penclawdd cockles, and Glamorgan sausage (vegetarian). What Makes a Full Irish Breakfast?